BRIGHT'S BUILDINGS & COBDEN'S ROW. Late in 1844 the Anti-Corn Law League promoted a scheme to increase the Free Trade vote, this involved their supporters in purchasing a freehold of the annual value of at least forty shillings and thus qualifying to vote in Parliamentary elections as county voters. The plan had been explained to Free Trade committees in the West Riding and to large meetings at Leeds, Bradford, Huddersfield, Halifax and Hebden Bridge and was favourably commented upon by the Leeds Mercury1. The opposition of the Chartists to the scheme will be readily understood by consideration of the following extract from the Mercury's editorial; in supporting this mode of extension of the franchise they concluded "We only object to the indiscriminate admission to that important trust of a mass of dependent, ignorant and every way unqualified persons." Hardly likely to endear the scheme to the labouring classes they were thus describing. The Mercury carried advertisements2 in December 1844 from Anti-Corn Law League committees in Leeds, Huddersfield and Wakefield, inviting those who had freehold properties to dispose of to give in particulars which could then be considered by those supporters of Free Trade who wished to invest in a vote. The property they were seeking was mainly cottages which would change hands for about £50 to £60. In the Huddersfield area 85 individuals participated in a modification of the scheme as first proposed. There were in fact collective purchases of two large blocks of freeholds, both of which were terraces of houses built by millowners for their workforces, and which became known as Bright's Buildings and Cobden's Row after John Bright and Richard Cobden, the two leading orators of the league. Bright's Buildings were a block of twelve newly erected houses together with a warehouse; the houses are still to be seen beside the A616 road to the south east of Honley, though the warehouse is no longer. The terrace is a substantial one, built of ashlar and, as a result, decidedly more attractive than the normal millworker's cottages of the period. The premises had been in the occupation of David Shaw Sons & Co., or their undertenants, and were sold on 30 January I845 by Benjamin Ledger Shaw in equal undivided shares to 50 individuals3. 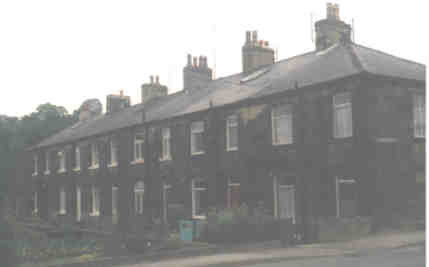 Cobden's Row was situate in North Crosland beside the Manchester Road near Stoney Battery. Again there were twelve houses, which had been erected by John and George Crosland, cloth manufacturers, who sold them on 22 January 1845 in equal undivided shares to thirtyfive persons4. The dates of sale are significant for electors only appeared on the roll if they were in possession of their qualification by 31st January in a particular year. Of the 85 people who bought shares in the two properties over 50 were from Huddersfield and the remainder, with three exceptions, were from surrounding townships. The three outsiders were John Haigh, yeoman of Kendal, Westmorland, William Clay of Manchester, a commercial traveller and John Sutcliffe the younger of Leeds, a manufacturer; the latter was a Huddersfield man and no doubt the other two had local connections. The vast majority of the new freeholders were self employed, the textile industry represented by, amongst others, wool and cloth merchants, there were various tradesmen as one might expect, drapers, builders and innkeepers; and less expected, an artist and an independent minister. Among the employed it is interesting to note that Edward Harling, an overlooker, and James Sugden, a warper, were actually occupants of two of the cottages in Cobden's Row. The effect of these multiple freeholds is clearly discernible in the Poll Book for the 1848 election in the West Riding, many of the names of the Free Traders are included amongst the 220 voters at Honley and the 187 at Lockwood, giving them the highest number of voters in all the Huddersfield Polling areas. The freeholds continued in their unusual format for forty years with one or two individuals acquiring blocks of shares as they came on the market. By the time decisive action was taken to reconsolidate both properties in 1886 the main benefit of the scheme must have accrued to solicitors in the form of conveyancing charges. It is no surprise to find that a solicitor, Thomas Robinson of Huddersfield, appears to have been the originator of the two groups in 1844, It was another local solicitor, James John Booth, who in 1886 purchased Robinson's block of fifteen shares in Bright's Buildings5 and who by 1894 had become the sole proprietor of that freehold6.